It is necessary to make a film about the Khojaly genocide at the Hollywood level for the whole world to know about it, Azerbaijani MP Malahat Ibrahimgizi said. She was speaking Nov. 6 at a joint session of Azerbaijan’s parliamentary committees on culture, labor and social policy, family, women and children affairs, science and education, as well as healthcare in the Azerbaijani parliament. Reminding that the film “Lejla” made after the genocide in Bosnia and Herzegovina, contributed to this event’s recognition all over the world, Ibrahimgizi noted that Armenians made several films at the Hollywood level to show the world how they were allegedly subjected to genocide. “Azerbaijan also needs to make a film at the Hollywood level about the Khojaly tragedy,” she added. 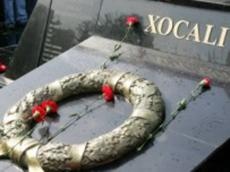 On Feb. 25-26, 1992, the Armenian armed forces, together with the 366th infantry regiment of Soviet troops, stationed in Khankendi, committed an act of genocide against the population of the Azerbaijani town of Khojaly. As many as 613 people, including 63 children, 106 women and 70 old people were killed in the massacre. Eight families were totally exterminated, 130 children lost one parent and 25 children lost both. Some 1,275 innocent residents were taken hostage, while the fate of 150 people still remains unknown.